Arvo Pärt will celebrate his 80th birthday in September 2015. There are bound to be many tributes to him and Peter Phillips and the Tallis Scholars have got in quite early. Though renowned for their performances of Renaissance polyphony the Tallis Scholars perform more contemporary music than many people might suppose though Peter Phillips is very discriminating in his selection. However, they have not committed a great deal of modern music to disc. I think I’m right in saying that, apart from a disc of music by Sir John Tavener (review), this is the only other album they have released which is devoted solely to the music of one contemporary composer. As the title of this album indicates, the chosen programme focuses on Pärt’s Tintinnabuli style of composition. There’s an excellent online video in which Peter Phillips explains the style, which is based on the sounds made by bells. The short film includes an ingenious and imaginative way of illustrating how the composer builds up and changes his harmonies and textures. These performances follow the normal practice of the Tallis Scholars in allocating just two singers to each part but the number of parts in some of these works means that the ensemble is expanded to as many as sixteen singers, with an extra alto added for Triodion. The Sieben Magnificat-Antiphonen are marvellous miniatures which form a very satisfying whole. These are settings, in German, of the so-called Great ‘O’ Antiphons, sung or said before and after the Magnificat at Vespers – or Evensong – in the seven days leading up to Christmas. I don’t know if Pärt had any thought that they might be sung individually in their liturgical context. However, heard as a set they make a compelling sequence and, as we are reminded in the notes, they are linked musically through a foundation on the note A and the use of triads derived from that note. Furthermore, at the end of the seventh antiphon Pärt reprises the music of the first antiphon. I must say I would like to hear them sung liturgically on the appropriate days to complement either a plainchant or simple polyphonic setting of the Magnificat. I’ve heard several fine performances of these antiphons in the past but I fancy this present recording may well be the best I’ve ever experienced. Having just two singers on each line makes for great clarity, allowing all the subtle changes in Pärt’s harmonies to register. The fifth antiphon, ‘O Morgernstern’, is especially fine here, the beautiful and gently luminescent music being presented in a rapt way. The singers are perfectly balanced against each other and, as a group, by the engineer, Philip Hobbs. In the last antiphon, ‘O Immanuel’, the music has mounting urgency and expectation as the coming of the Messiah is anticipated with ever-growing excitement. Phillips and his singers convey this marvellously and then achieve to perfection the way the piece subsides to remind us of the quiet music we heard at the beginning of the sequence. Fittingly, these Magnificat antiphons are followed by Pärt’s setting of the canticle itself. This piece, as Peter Phillips says, “illustrates Tintinnabuli with little embellishment.” The music is pared back to essentials and with such spare textures there’s nowhere for performers to hide. Not that the Tallis Scholars need to hide: theirs is a performance in which the tuning and ensemble work has the utmost precision. The passage in St Luke’s Gospel that sets out the genealogical tree of Christ might seem infertile ground for a musical composition. After all, in essence it is a list. In Which Was the Son of… Pärt set this list to fulfil a commission by the city of Reykjavik and in so doing he enjoyed an affectionate joke concerning the way Icelandic names are derived. It’s an ingenious piece and in the first section the bouncing rhythms seemed to me almost to convey something of the spirit of American Gospel music, though I’m sure that was pure fancy on my part. When Pärt gets to the end of his ‘list’ the way he sets the word ‘Amen’ is a genuine QED. The Woman with the Alabaster Box and Tribute to Caesar were written as a pair of works and set passages from the Gospel of St. Matthew. In both cases substantial amounts of narrative proceed through block choral chords. That description might suggest that the pieces are dull but, on the contrary, I found the narration to be compelling, especially in such a committed pair of performances as these. Both pieces are wonderfully imagined for the voices. Triodion is a wonderful way to conclude the programme. It consists of three Orthodox prayers of intercession framed by an Incantation and a Doxology. Pärt’s settings of these prayers are very moving, especially the start of the second prayer, to the Virgin, which radiates humility and awe. The last line of each prayer is set to hesitant and humble music which is repeated several times. These are absolutely outstanding performances. The singing is beyond reproach and the Tallis Scholars penetrate to the heart of Arvo Pärt’s music. On the surface Pärt’s music seems simple but there are hidden depths and these pieces are as ingenious as they are sincere. It is a brave composer – and one who is highly accomplished – who can strip his music consistently back to such bare essentials and yet speak with such simple, unaffected eloquence. Engineer Philip Hobbs is well accustomed to recording the Tallis Scholars in Merton College Chapel and that experience shows in abundance. The sound is beautifully balanced and clear; the recording presents the voices very pleasingly in the warm resonance of the chapel’s acoustic. As ever with Gimell, the documentation is first class. I doubt that in the coming year there will be many tributes to Arvo Pärt that surpass the excellence of this one. The Tallis Scholars usually follow a self-denying ordinance of keeping to Renaissance repertoire, but it hasn’t always been so. Two years ago they released a short download-only recording of the music of Eric Whitacre (GBADM1380201 – review*) and last year they reissued at an attractive price an older recording of the music of John Tavener which many of us had been campaigning for (Ikon of Light, GIMSE404 – review). Now, most happily in time for the composer’s eightieth birthday in September 2015, comes this new release. 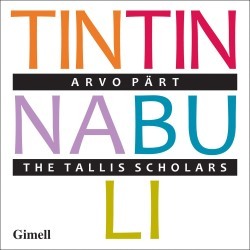 I use the word ‘chimes’ deliberately because the title of this recording, Tintinnabuli (genitive of Latin tintinnabulum = bell) refers to the style which Pärt adopted after 1976. There’s no actual piece of music by that title on the album but all the music dates from after that date and all to a greater or lesser extent illustrate the bell-like style. I won’t go into all the details here of how that applies to each piece because you can read Peter Phillips’ notes on both the Gimell and Hyperion websites and you can find a YouTube video of him explaining the Tintinnabuli technique. Most readers will have some idea of Arvo Pärt’s distinctive and hauntingly beautiful sound by now, so I’ll merely add that it takes a rare talent to make the boring genealogy from Luke’s Gospel (‘which was the son of …’, track 9) sound fascinating. Two Hyperion recordings, both from Polyphony and Stephen Layton, provided my benchmarks: for The Woman with the Alabaster Box and Tribute to Cæsar, conceived as a pair in 1997, CDA68056 and for Nunc Dimittis, … which was the son of …, I am the true Vine and Triodion an earlier recording, one of Hyperion’s thirtieth-birthday reissues (mid-price CDA30013). Comparing a Netherlands Chamber Choir recording of Nunc Dimittis on the Globe label with Polyphony, I preferred the way in which the latter shape the music so as to emerge as it were from nowhere and return to nowhere. Though I made the Globe CD (GLO5252 – review) a Recording of the Month, I marginally preferred Polyphony in this work, though we have to take the opening words for granted, so quietly do they begin. The new recording strikes a balance between too inaudible a beginning and emerging too soon from the darkness – an effect entirely appropriate for an evening canticle, sung at Evensong or Compline. Polyphony take 7:33 for the Nunc dimittis; the Tallis Scholars, who also usually like to give the music time to breathe, are just a little faster at 7.13. The Globe recording is noticeably faster at 6:33 but doesn’t sound rushed. If I give the new recording a slight edge over the other two, all three are very effective. Incidentally, I erroneously gave the date of the work as 1989 when reviewing the Globe: that’s the date of the unrelated Magnificat. In the other works which Polyphony have also recorded there’s very little to choose between them and the Tallis scholars. To borrow a tennis term, the score is deuce, with advantage to one or the other in individual pieces. I’m surprised to see that we apparently failed to review CDA68056 when it appeared recently but it received a well-deserved warm welcome in other quarters. As just two works are common to the Hyperion and the new Gimell and much of the rest of each programme is otherwise unavailable or sparsely represented in the catalogue, I have to commend both. The potential risk to your bank balance can be reduced by downloading the Polyphony recording from Hyperion (mp3 and 16-bit lossless for £6.99, 24-bit for £10.50, both with pdf booklet) and the new recording from Gimell or Hyperion (details below). Let me also include a reminder of another excellent Polyphony recording of the music of Arvo Pärt, this time a reissue on Hyperion’s super-budget Helios label: the Berliner Messe, Magnificat, etc., on CDH55408: Reissue of the Month – see DL News 2014/10. I downloaded the new Gimell recording from hyperion-records.co.uk, where it’s available in mp3, 16-bit, 24/96 and 24/192 formats. I tried the mp3 and 24/96, and both sound excellent with, of course, an advantage in terms of clarity and stability from the 24-bit. It's also available from gimell.com in all these formats plus 24-bit 5.1 surround sound. In both cases the booklet comes as part of the deal and is well up to Gimell’s – and Hyperion’s – excellent standards. All in all I enjoyed hearing this new Gimell recording as much as all concerned clearly enjoyed making it. I’ve already made this a Recording of the Month in my shorter review in Download News 2015/2. Gimell’s recordings of the Tallis Scholars are special occasions and this is extra-special. When things seldom come, they wished for come. I’m torn between hoping that they will soon give us more of their renaissance core repertory which they do so well and that they will step outside it again in the near future. Either way, I wish that they would gratify us more often. * NB Please note catalogue number from Gimell, which would be my preferred source: the number listed in the review refers to the iTunes download.